Hot Lap Experience on sale now! Imagine a place where you can enjoy your passion for all things automotive and motorsports. You can have your own Private Garage surrounded by other enthusiasts, repair and restoration shops, restaurants and even a performance track. An exhilarating 1.5 mile state-of-the-art road course. Our world-class track is the central feature of M1 Concourse and was professionally designed with challenging turns and elevation changes for the ultimate driving experience. An unparalleled venue located right on famed Woodward Avenue. Facilities include a performance/test track, multi-purpose outdoor event arena with a 2.5 acre skid-pad, and covered event spaces that can accommodate groups of 500. Rev up your next private or corporate event. Learn to push the limits of the most powerful automotive machines. The professional staff at M1 Concourse offers adult and teen defensive driving programs, high performance driver’s education and unforgettable team building experiences. Our schools are at the forefront of driver education. Register to build your profile, book track times, sign-up for events, receive special offers and more. 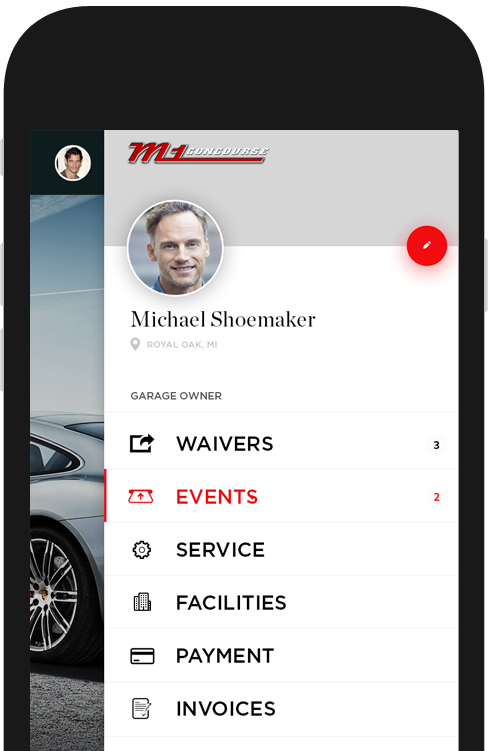 Take advantage of all the benefits of being a member of the M1 Family.